This article is about a plant colloquially known as bunny ears. For other uses, see Bunny ears (disambiguation). Opuntia microdasys (angel's-wings, bunny ears cactus, bunny cactus or polka-dot cactus) is a species of flowering plant in the cactus family Cactaceae, native and endemic to central and northern Mexico. Opuntia microdasys forms a dense shrub 40–60 cm tall, occasionally more, composed of pad-like stems 6–15 cm long and 4–12 cm broad. Instead of spines it has numerous white or yellow glochids 2–3 mm long in dense clusters. They are barbed and thinner than the finest human hairs, detaching in large numbers upon the slightest touch. If not removed they will cause considerable skin irritation so the plants must be treated with caution. The Latin specific epithet microdasys means “small and hairy”. The yellow flowers appear only rarely. Despite this, it is a very popular cactus in cultivation, partly because of the young plant’s comical resemblance to a rabbit’s head. It has gained the Royal Horticultural Society’s Award of Garden Merit. The very closely related Opuntia rufida differs in having reddish-brown glochids. It occurs further north in northern Mexico, and into western Texas. Some botanists treat the two as a single species. 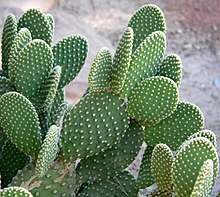 ^ a b "Opuntia microdasys". Encyclopedia of Life. Retrieved 14 April 2018. ^ Harrison, Lorraine (2012). RHS Latin for Gardeners. United Kingdom: Mitchell Beazley. ISBN 184533731X. 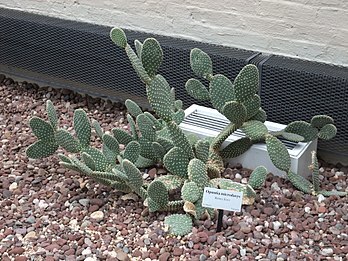 ^ "RHS Plantfinder - Opuntia microdasys". Retrieved 14 April 2018. ^ "AGM Plants - Ornamental" (PDF). Royal Horticultural Society. July 2017. p. 70. Retrieved 14 April 2018. 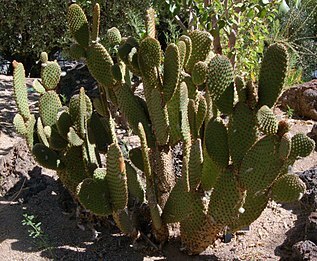 Wikimedia Commons has media related to Opuntia microdasys. This page was last edited on 24 March 2019, at 14:28 (UTC).